Turnovers: the Existential Threat to Football Success! A key component to winning or losing on the football field is turnovers! TOs can play a huge part in any football game, for good or ill.
Fumbles: dropping or losing hold of the ball when in play. Interceptions: A defensive player catching a pass intended for an offensive player. Muffs in the kicking game: on kickoffs or punts, dropping a catch or otherwise allowing the ball to touch a defender without controlling it, creating a loose ball that can be recovered by the kicking team. Safeties: Safeties aren’t technically considered turnovers either, but they have essentially the same effect and cost two points as well. Lax ball security: Improper carrying technique, poor timing execution. Miscommunication between QB and receivers and/or ball carriers: throwing late or early, poor route running. Poor spin technique by the thrower, making balls hard to catch. A pass trajectory that is too low can lead to a tipped or partially-batted ball — if it doesn’t cause an interception outright — increasing the chances of an interception. Blocked kicks or punts, conversions and field goal attempts that fall short: poor gap and lane control may lead to the opposition recovering, and moving the ball a long way up the field or scoring. Penalties and other negative plays increase the odds of turnovers via higher-risk play calls to get yardage back. End Zone errors usually have an enormous impact on a game. A safety costs two points and a possession change. Fumbling the ball into or through the opponent’s end zone results in a touchback and possession change, instead of the anticipated six points. So does an end-zone interception, if it isn’t returned for even more yards or even a touchdown. The most famous pick six ever! Turnovers can be game changers. Even season makers or breakers. 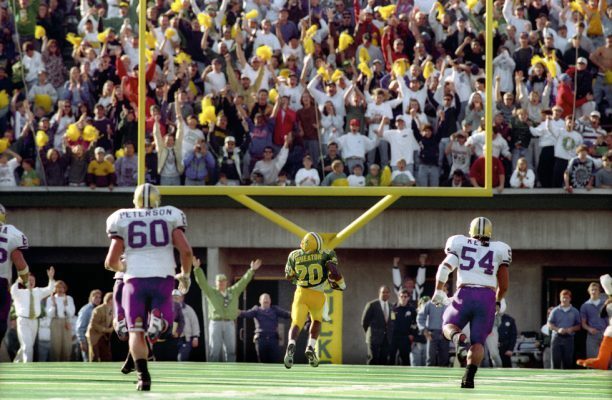 Witness Kenny Wheaton’s “the Pick” against Washington in the 1994 Rose Bowl season. Up until this gigantic turnover, the Ducks were basically owned by the boys from Seattle. What a change play, and an iconic hero created! Turnover margin isn’t the only metric that affects wins and losses: even though Wyoming 8-5 and Oregon 7-6 last year, Wyoming led the NCAA in TO margin in 2017 with a staggering +25, and Oregon was a very average 65th, with a flat zero. Nevertheless, TO margin is still a critical factor in team success — a negative TO margin in a game significantly increases the chances of losing it. Victory or defeat, loss or gain of esprit de corps, blame, shame and fan furor, or ecstasy and joy for the masses! Momentum swings are mighty change agents! Turnover Prevention: Taking Care of the Football Is Paramount! Top coaches make ball security a top priority. Drills, with repetition and technique are emphasized. 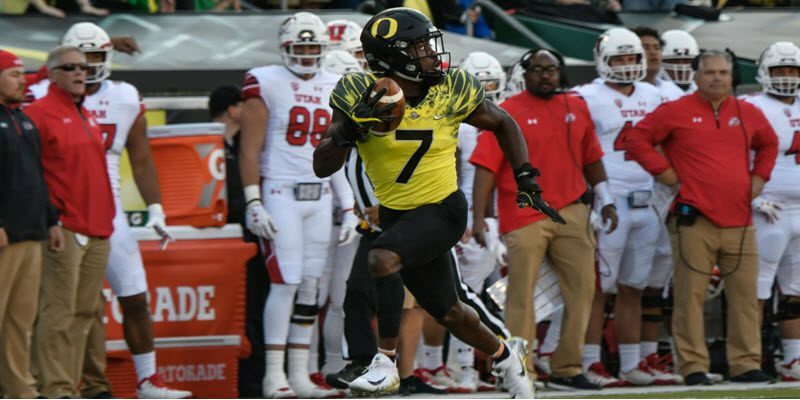 High and tight for ball carriers, tuck, duck, keeping it close to the body for receivers. Take what the defense gives, while not losing focus by trying to extend plays. Good coaches teach players how to dislodge the ball from offenses with hand position, spearing the ball with the helmet or punching it out. They teach defenders how to read the eyes of QBs and receivers to position themselves for “picks.” They relentlessly practice reliable methods to dislodge the ball, until second nature kicks in. Loose ball drills teach aggressive “get the ball” tactics. Special teams play is nearly a quarter of the game. The plays have many multiple moving parts and roles, which need synchronicity to succeed. Creating havoc and confusion on the field increases the odds of an adversary “coughing it up.” Fielding a ball in heavy traffic is a dangerous play with high risk. Skilled punters can pin down offenses with coffin-corner, high-hang-time kicks, increasing TO risk. 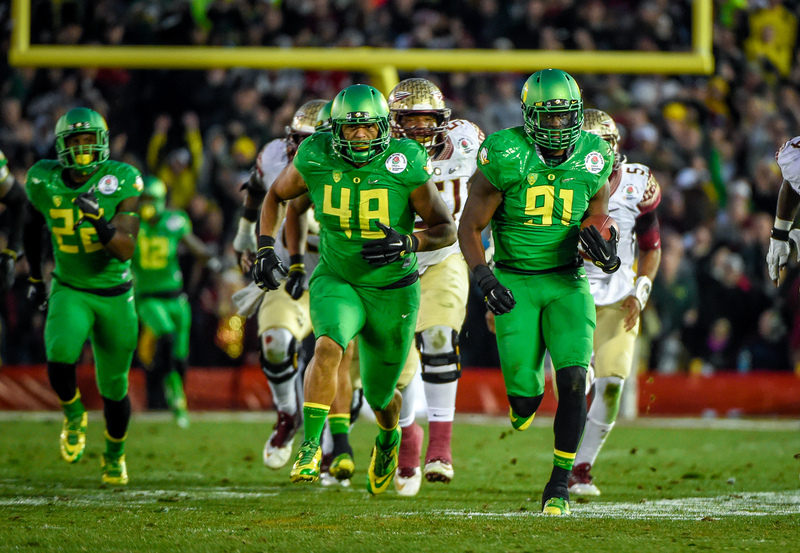 The Oregon defense got five turnovers against Florida State in the Rose Bowl. TOs are unforeseen, cast by the elements in all their fury. Sun, shade, cold, wind, changing ball flight on passes or kicks, rain and dreaded downpours make the ball slick and heavy, increasing the difficulty of ball control. The funny bounces a ball makes can have big consequences with possession too! Momentum Giving up a TO is the ultimate negative game changer, bleeding confidence, shattering morale and sowing doubt. Gaining one has the polar opposite effect, pumping up team effort, confidence, intensity and enthusiasm. The quarterback is the hub through which plays originate. He must have good, soft. yet firm hands to process hand-offs, passes, laterals or when diving to the end-zone for a score. 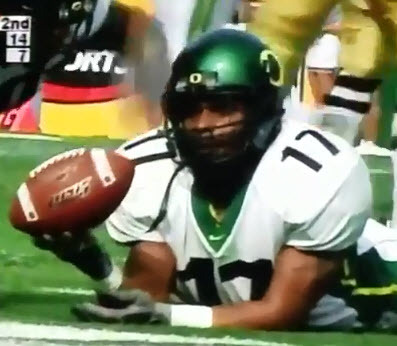 Watch closely how Oregon’s QBs “handle the rock” to process these winning plays and prevent TOs. Finally, when and where TOs occur makes all the difference in game outcomes. We are talking “mighty mo” here. Turning it over late, particularly heading to the goal line to win or tie, can have catastrophic consequences. An epic fail! Garbage time TOs have almost no impact on outcomes. However, they often lead to coachable teaching moments for new or inexperienced players. Have I missed any TO types? Can the Ducks improve on last season’s 25 takeaways, and give up fewer than the 25 they managed last year? Here is hoping the Ducks improve their turnover margin from last year’s very average zero (25 gained, 25 lost), and move up in the win column as well!